Bobby Beausoleil - "Lucifer Rising: The Original Motion Picture Soundtrack"
There is definitely a long, strange trip that leads up to the release of this CD. It’s certainly worth relating. It begins in the 1960’s with a then young musician named Bobby Beausoleil and his psychedelic chamber music group called The Orkustra. Avant-garde filmmaker Kenneth Anger chanced upon a performance of The Orkustra at the legendary San Francisco happening known as The Invisible Circus. 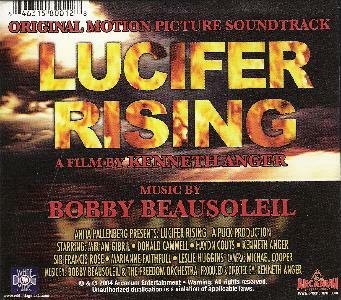 Impressed more with Beausoleil’s magnetic stage presence than the music itself, he asked the young musician to play the title role in his next planned film, Lucifer Rising. Beausoleil agreed, as long as his band could perform the music for the film. Throwing himself deep into the project, he ended up alienating his other band members, who left. Undaunted, Beausoleil formed a new band, The Magick Powerhouse of Oz. Unfortunately, after the first live performance of the new band, Beausoleil and Anger had a falling out. Anger moved to England, while Beausoleil drifted down to southern California, where he met a young man named Charles Manson. Although Beausoleil was only involved on the periphery of Manson’s circle, he did get involved with some of the biker gangs that frequented the Spahn Ranch where Manson and his group hung out, and ended up being involved in the murder of a double-crossing drug dealer. After his arrest, and while Beausoleil awaited trial, Manson and his cult committed their now infamous helter skelter murders. Linked to Manson’s group at his trial, Beausoleil was given the maximum sentence. Meanwhile, Anger commissioned Jimmy Page to score the still only partially shot Lucifer Rising. Page produced about 28-minutes worth of music, but the project seemed to be going nowhere. Back in California, Beausoleil refused to let the oppressive Tracy State Prison surroundings squash his spirit, and instead formed a band within the walls of the institution, made up of inmates. When he heard that Anger was still working on the Lucifer Rising project, he pulled his group of inmate musicians together and recorded demos for the film director. Anger was so impressed, he reportedly gave Page his walking papers and commissioned Beausoleil to once again score Lucifer Rising. With the approval of a cooperative prison warden, but on an extremely limited budget, Beausoleil built a small recording studio from scratch within the walls of the prison, and slowly over the next few years, with the help of his fellow inmate musicians, now dubbed The Freedom Orchestra, he recorded the soundtrack to Lucifer Rising. Over 35 years after being originally incarcerated, Beausoleil still resides in Tracy State Prison. From behind those walls, he continues his recording career, having released several albums. He is also the facilitator for the Los Hermanos Youth Intervention Program, and has directed a series of videos called A Framework for Breaking Barriers, a cognitive skills development program designed to provide prisoners with tools that can help them break free of the cycle of recidivism. Many people feel it is about time Bobby Beausoleil was freed from prison. Beausoleil’s remarkable soundtrack is finally available on CD through Arcanum records. The double disc CD includes extensive liner notes, the entire original 45-minute score for Lucifer Rising performed by The Freedom Orchestra on one disc, and a collection of rarities on the second disc which include a couple of short recordings by Beausoleil’s original band The Orkustra, 25-minutes of the original Magic Powerhouse of Oz soundtrack sessions recorded in 1967, and 28-minutes of early Freedom Orchestra rehearsals. That’s the official story, now how’s the music? It could be easy for the fascinating story behind the music to overshadow the final production, but in this case, I’m happy to report that the music is just as interesting as the story. The soundtrack on disc one walks the often dark and shadowy realms between orchestral music, experimental electronic music, and exploratory psychedelic rock. Imagine Walter Carlos jamming with the late 60’s Pink Floyd and a small rag tag orchestra and you might have an idea of what it sounds like. This is evocative, brilliant stuff that doesn’t need a film to go with it to be enjoyed (I myself have not seen the Kenneth Anger film). What it does need is a willingness to lay back, close your eyes and float into a lost past that had its roots in the Summer of Love, when everything was about freedom, and ended in a place where freedom was at a premium. This lost past was a time when experimenting was part of the very fabric of youthful life, and music was one thread in that vast fabric. Beausoleil’s soundtrack, with its washes of primitive electronics, raucous percussion, whooping horns, bluesy guitar, and hypnotizing organ seems both earthy and cosmic at the same time. There’s not much more that I can say about it, because no description would really accurately capture the nature of the music. This needs to be heard. Disc two kicks off with two vintage tracks of Beausoleil’s original band, The Orkustra. The first of these recordings, Punjab’s Barber, sounds somewhat as if Sun Ra had decided to play rock music instead of jazz, still with lots of horns and a classical influence, belied only by the electric guitar snaking through the mix. The second of these, Flash Gordon, is more of an electric romp, with a touch of hoedown twang to the avant-classical rock sound. From there, we move onto The Magic Powerhouse of Oz, with their original recordings for the Lucifer Rising soundtrack from 1967. This is different music altogether from the soundtrack Beausoleil would eventually produce. This is much rougher, and doesn’t display the electronic experimentation that would form the backbone of the eventual soundtrack. Still, it’s a fascinating listen; a great, big, loud stew of rock and experimental jazz. Chaotic, almost orchestral style drumming propels 60’s electric guitar jamming while horns and a flute punch their way through the mix. Again, the avant-jazz, Sun Ra influence can be heard as the band stretches out, exploring the possibilities. This is a true and unique time capsule; a glimpse into the wild experimentation that was going on in the Summer of Love; a glorious and somewhat dark celebration of sound, freed from the constraints of rock, classical, and jazz, yet incorporating all three. The early Freedom Orchestra sessions show considerable advancement in an early approach to the final soundtrack. The electronics are here now, and Beausoliel has taken a more dynamic and planned out approach to the sound, as it careens back and forth between minimalist electronic soundscapes to full out rock jams. The roots of the final soundtrack can be heard in this more primitive, rougher version. Still, it’s intriguing to think that inmates in a prison performed this. Beausoleil either lucked out in finding a group of prison inmates who all happened to be into taking such an way-out approach to music, or his vision truly inspired them. Either way, it makes for a fascinating trip into something almost impossible to imagine. I might point out, as I suggested before, that these original efforts are really completely different compositions from the final soundtrack. Although you can hear some of the ideas in the early Freedom Orchestra sessions that would become parts of the final effort, each is it’s own unique creation. Lucifer Rising: The Original Motion Picture Soundtrack is nearly two hours of vintage, experimental rock that steps beyond the boundaries of what we know, and touches something that is both comforting and terrifying. Highly recommended! For more information you can visit the Arcanum Entertainment web site at: http://www.arcanument.com. You can learn more about Bobby Beausoleil at his web site: http://www.beausoleil.net/bobby.html.